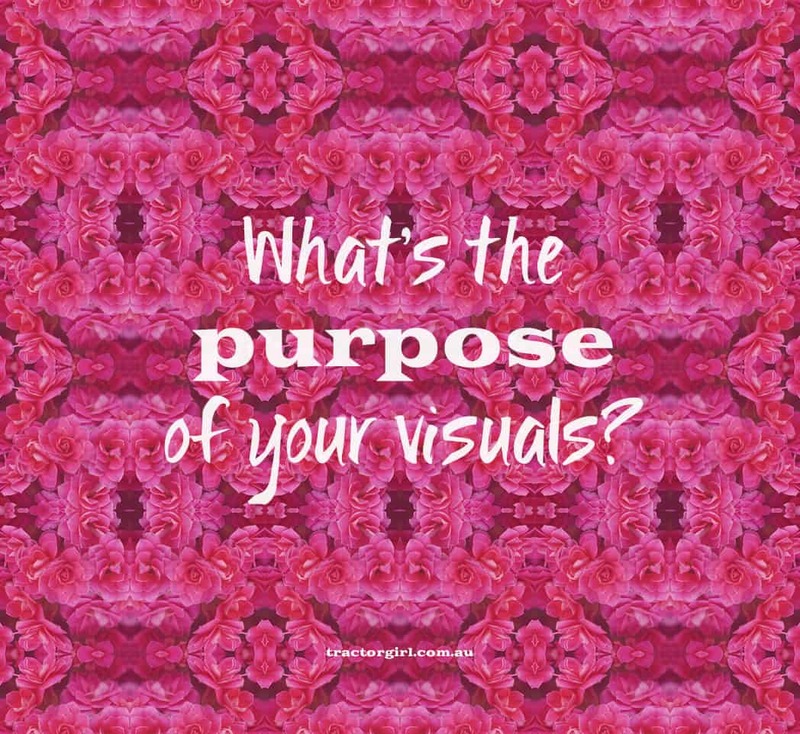 What’s the REAL purpose of your visuals? It’s definitely not just about looking pretty. Looking pretty is all fine and good, and having good-looking graphics is definitely something you need to aim for. BUT, business graphics are about communication, first and foremost. Otherwise, why have them? You want to let your audience know who you are, and why you’re right for THEM; how YOU can solve their problem or fulfill their desire better than anyone else they’ve come across. So choosing your visuals and creating your graphics for your business should always come from a place of strategy. And when you understand that, then you come to understand that you need to know exactly who your audience is, and what they’re looking for. There is always a purpose for putting out every piece of visual content as your brand, even if it’s simply to entertain, and/or engage. And of course you can do that in myriad ways. But before you go posting stuff willy-nilly all over Facey/Insta/website/wherever, you need to be sure of your branding, and what it is exactly that you want to put out into the world. Part of the purpose of branding yourself is to create recognition so that you’re top of mind when people are looking for the thing they need/want. The other part of branding is about creating the exact “vibe” or mood that fits with what’s in your audience’s head when they go looking. The way to figure this out is a mix of things. Firstly, sit down and think about how you want to be seen in the world. If your brand was a person, what words would you use to describe its personality? Do you want to be perceived as bouncy, reserved, sophisticated, childlike, inventive, sleek… or? Then, consider what’s in your audience’s head, and what the feeling is that they’re looking for? What do you want your customer to feel when they work with you or receive your product? How do you want your audience to feel afterwards? Luxurious, vibrant, joyful…. The combination of these two aspects – what you want to project, and what your audience is looking for – is where your branding magic lies. Start by writing down all those words down. Then you can look for images that fit with those words (and discard the images that don’t fit – even if they’re pretty). You can connect all your visuals to those words. You can choose colours to go with the words if you use a tool like Picular (which actually sources colours from the images within Google’s search results for each particular word). Or, you can start by focusing on a colour or colours you like. Then, trust your intuition more – we all know that a “newborn” palette will feel very different from a “sophisticated” palette or a “masculine” palette. Another way to get there is when you have one colour you like, there use one of the many colour palette generators that can help you choose the rest (Coolors.co is fab). Or just look through Pinterest. However you do it, always keep those brand “keywords” in mind as your filter. Do you want to speak to their fears? do you want to speak to their desires? If your ads speak to their beliefs about where they are right now, for instance, you might choose images that convey their frustration – an image of the exact situation they’re in right now. You could choose deeper, darker colours to support that; images with less colour or even black and white might be used to convey the lack of vibrancy they’re feeling. Or you could choose an image of the situation they’d like to be in. Happy, calm, joyful, in a luxurious situation, or whatever it is they’re aiming for. You could go for brighter, warmer colours that feel more vibrant. If you want to convey what they desire, then don’t choose an image or a palette that looks dark and mysterious – unless mystical and magical is what your target market is aiming for. ALWAYS consider what’s in your audience’s head, and what you want to communicate to them! As you can see, figuring out your visuals becomes a much easier task once you know exactly what it is you want to communicate. It’s a much more logical, and step-by-step approach than having the whole universe of colour, images, shapes, and more to choose from! I know I’ve barely scratched the surface on business visuals, but that’s not the aim. The real aim of this article is to get you thinking about what’s behind what you put out in the world – the better thought out your visuals are, the more likely they are to do their job. Their job is to communicate AND be memorable. (If you’d like, you can read more about choosing colours HERE). 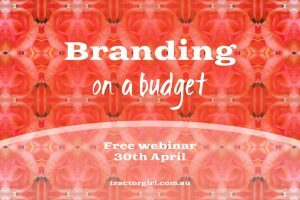 You can also join my FREE webinar, Branding on a Budget, where I’ll introduce you to my favourite free and low-cost tools to help you create visuals you love, and I’ll show you how to use them as well so you save a heap of time too. AND you could win 60 minutes of 1:1 with me to talk through YOUR branding and visuals – all you have to do is sign up for the webinar and you’re in with a chance! All the details and sign up HERE.